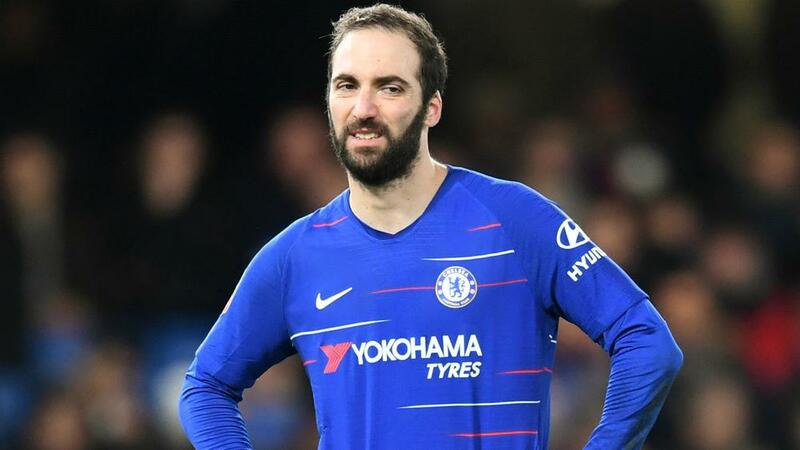 Chelsea boss Maurizio Sarri admits Gonzalo Higuain has found it difficult to adapt to life in the Premier League. The striker has made seven appearances in England's top flight since joining on loan from Juventus in January, scoring three goals in matches against strugglers Huddersfield Town and Fulham. Higuain, who hit 36 Serie A goals in 35 games under Sarri at Napoli in 2015-16, was substituted after 66 minutes of Chelsea's disappointing 2-0 defeat to Everton before the international break. Sarri's side head into Sunday's game at Cardiff City trailing fourth-place Manchester United by four points after Ole Gunnar Solskjaer's men beat Watford on Saturday, meaning anything less than a victory could prove costly in their top-four chase. And Sarri is eager for Higuain to recapture his top form to help Chelsea in their final eight league matches and their Europa League campaign, with a quarter-final against Slavia Prague to come next month. "I would like to see him at the top in the last two months," he said. "At the moment, only this is really important. We need Gonzalo at the top. "It is not easy, I think, to get used to this championship. The level is different. The way of playing is different. I think, especially for a striker, it is very difficult to get used to the Premier League in just one or two months. "He said to me that it is difficult because the physical impact of the defenders here is really very strong. The referees here are really very different than in Italy, and so it is another football for him and especially for a striker or goalkeeper. "It is really very different, so he needs time, but we have no time. We need him to get to his top level in these last two months."